← A LIBERAL? WHO, ME? 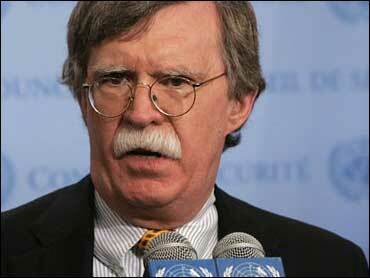 A Bolton run would be more fun than a human being should be allowed to have. John is already a certified target of the liberal press so we know he is a bona fide conservative. He knows his way around Washington but without the tarnish of ever having been an elected politician. He is a no-nonsense guy who goes right to the point. The greatest scandal in his background was relieving an incompetent bureaucrat from his duties. Somehow I don’t think that will hurt him. And best of all, he can speak with no teleprompter at all. This entry was posted in News, Opinion and tagged 2012 candidates, Bolton. Bookmark the permalink.